Childhood trauma is the silent and pernicious enemy of learning and it is more pervasive than most of us realize. One in five Boston students has had a traumatic experience, according to a new study by Boston Children’s Hospital. As teachers, we are often the first line of defense in helping these students, but we need the resources to help them find their way. Trauma threatens our students’ potential to achieve. It disrupts memory, organizational skills, and comprehension. In our classrooms, this means that many of our students have difficulty completing tasks, such as taking notes or recalling information. Trauma also affects their ability to build trusting relationships with adults and each other, as the stress can cause students to feel unsafe and trigger fight-or-flight responses over seemingly ordinary occurrences. When students become withdrawn or act out, too often we fail to address the root cause of this behavior, or we take a punitive approach. As a result, students become disengaged or their behavior escalates, leading to suspensions, expulsions, and even the criminal justice system. We cannot continue to squander the futures of our most vulnerable students. This is the issue that teachers across Boston identified again and again in a series of one-on-one conversations with the teacher-led organization Educators for Excellence-Boston (E4E-Boston). Student trauma also emerged as one of the top education priorities in a poll of 100 randomly selected Boston Public School teachers. So it is no surprise that in October 2016, teachers at a caucus-style event unanimously chose to advocate for how to better support students with trauma. 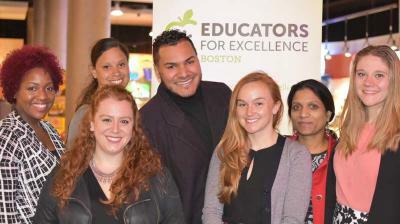 Once teachers selected the issue, our group, E4E-Boston’s Teacher Action Team, was formed. Our team represents teachers from across various settings in Boston who are dedicated to advocating for students in and beyond our classrooms. We met frequently to understand how policies at the city and state levels could better foster trauma-informed schools, and wrote policy recommendations for district, city, and state level leaders. Our team of educators, social workers, and student support specialists did more than simply rally around this issue. We conducted research, collected data, and hosted focus groups across the city. In our surveys from over 160 colleagues across Boston, 91 percent of educators reported that student trauma is a challenge at their schools. Our own classroom experiences, along with those of nearly 400 Boston teachers, led us to the ten policy recommendations that we outline in the paper “Schools that Heal.” Our school-, district-, and state-level recommendations focus on deepening teachers’ ability to teach trauma-impacted students, cultivating a trauma-informed school community, and updating the funding formula to reinforce schools with the resources to educate students who have experienced trauma. As educators, we know that schools can be healing places. Many of our students are grappling with the effects of trauma, yet we are often working in schools where educators have not yet received the training and resources needed to support them. For schools to truly become trauma-informed communities, educators must have a critical voice in leading this work. Massachusetts and Boston have long been national leaders in providing students a quality public school education, and now we have the opportunity to once again lead the nation by fostering and creating trauma-informed school communities for all students. You can find the full policy paper and all our recommendations at e4e.org/schoolsthatheal. We encourage you to read it and join us in advocacy. Swapna Bolleboina is a special education teacher at Higginson-Lewis K-8; Nina Leuzzi is a pre-Kindergarten teacher at Bridge Boston Charter School; Antonelli Mejia is a student support counselor at Fenway High School; Kayla Morse is a second grade teacher at Oliver Wendell Holmes Elementary School; Stephanie Pottinger is a science teacher at the Richard Murphy K-8 School; Alycia Steelman is a special education teacher at Dearborn 6-12 Stem Academy; and Abigail Van Dam is a special education teacher at Up Academy Holland.